You can't argue with the HP 935c for its crystal clear printouts. Some day in the not too distant future your HP 935c will run out of printer ink, and when that does happen you'll quickly learn that brand new HP 935c ink may be pricey. But you don't need to get stressed about forking out the steep asking prices you'll uncover on the main street because here at Cartridge Save you can find all the HP 935c cartridges you will want at super competitive prices. Save a lot of money on your ink by shopping with Cartridge Save! There's no sense in spending so much for the 935-c original cartridge or 935c compatible ink in the high street when it is far more simple to save cash buying with Cartridge Save. You have utter peace of mind by ordering DeskJet 935c ink cartridges from us because they are underwritten by a no quibbles money back guarantee. Don't forget that every single purchase also comes with free delivery, usually arriving with you on the following working day! Homes and offices need a basic printer that can produce quality prints and photos will appreciate the affordable HP Deskjet 935c. Running costs are fairly low with its minimal power and ink consumption. The only trouble of the HP Deskjet 935c is its age, it may seem low-tech for up-to-date offices or users and it can't be run on new operating systems. The reliable HP Deskjet 935c is simple and is easy-to-use. It has a tray at the bottom and 3 buttons on the top right hand of the printer. The monthly duty cycle is 2000 pages and the maximum input capacity is 100 sheets. The HP Deskjet 935c uses drop-on-demand thermal inkjet printing and HP PhotoREt III printing technology. 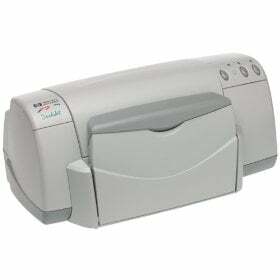 The HP Deskjet 935c is a reliable basic printer. It does not need to be calibrated regularly and lasts many years. Printing quality is very good, and most importantly, energy consumption is low and replacement inks are affordable. Because it is an older model, the HP Deskjet 935c may not be compatible with newer operating systems. Connectivity is also limited, and networking is not supported. Print speed is rather slow. Also, the HP Deskjet 935c does not have up-to-date features like a duplexer.